It's Gloria from Girlia's Cards. Its Action Wobble time! I have a card that I want to share with you. An Action Wobble on your card just brings any image on your card to life and I am sure you will agree it will be too irresistible not to play with and or watch it wiggle. Just look at this little duck. 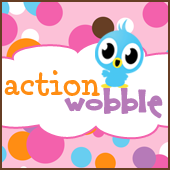 Get your Action Wobbles today!